What is a workplace assessment? Workplace assessments are designed to look specifically at the interaction of individuals with their workplaces and are considerate of various factors including physical environments, psychological & cognitive demands, job demands and task performance, and social interactions. Workplace assessments are employed to effect safe, comfortable and productive workspaces by bringing human abilities and limitations into job performance and workplace design considerations. Thorough workplace assessments are able to deliver well-balanced working environments that are able to sustain employee health and wellbeing, and reduces an organisation’s risk and associated costs of injury or illness in the workplace. What is a workplace assessment likely to involve? What a workplace assessment produces? Allied Health advocacy for support with equipment, modifications and services procurement following formal approval receipt. We welcome your enquiry. 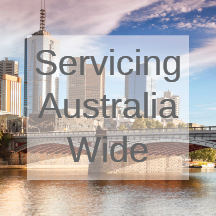 Recovery Partners are able to coordinate for an array of references with respect to our workplace assessments upon your request. Do you need help with your workstation ergonomics? 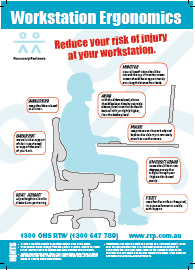 Download our FREE poster outlining optimal ergonomic postures for work. Simply fill out the form to download.